Setting up the demo content is super easy with our 1-Click Demo Importer. Step 1 – Log into your WordPress Dashboard. Step 2 – Go to Appearance > Import Demo. Step 4 Click the Import button to start the import process. Step 5 – Wait until the process is done and the page is reloaded. This may take a while. Do not interrupt/cancel the import process! Warning, although importing demo will not remove your existing content. It is highly recommended for new installations only. Some servers don’t support one click import. If you host your site on a sharing server or your server can’t handle the import traffic, one click import will fail. In this case follow these steps to perform manual demo import. These steps are guidelines for a manual demo import. File names may vary depending on the Demo you are importing. 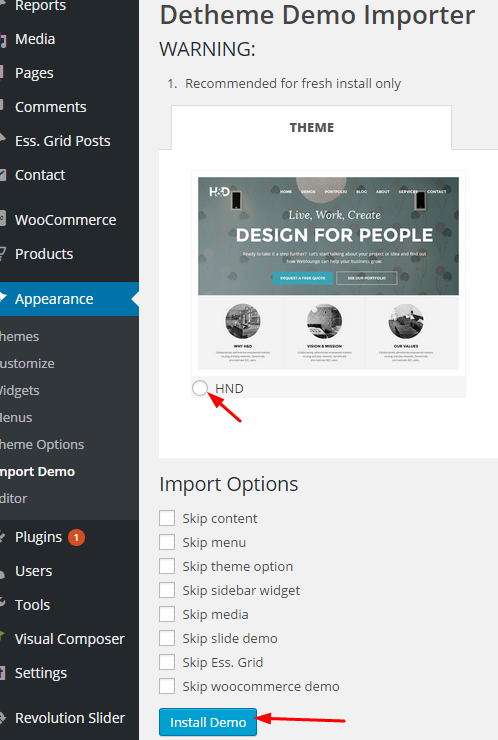 Step 1 – From your dashboard click on Tools -> Import -> WordPress and install WordPress Importer. Step 2 – Click on Activate plugin & run importer. Step 4 – Click Upload file and import. Step 5 – Check Download and import file attachments. Step 6 – Click Submit. Step 7 – Wait for All done have Fun! message. If you don’t get the All done have Fun! message go to Appearance -> Menus delete all the menus and start over again until you get the message. Step 1 – Click on Appearance > Menus. Step 2 – Switch to Manage Locations tab at the top of the page. Step 1 – Click on Settings > Reading. Step 1 – Navigate to Appearance > Theme Options > Import/Export tab. Step 1 – Click on Revolution Slider tab in your dashboard. Step 2 – Click on Import Slider button. Step 1 – Click on Plugins > Add New. Step 3 – Go to Tools > Import > Options. Step 5 – Click on Upload File and Import. Step 7 – Click on Import Selected Options.